Kalashnikov lovers of the world, unite! 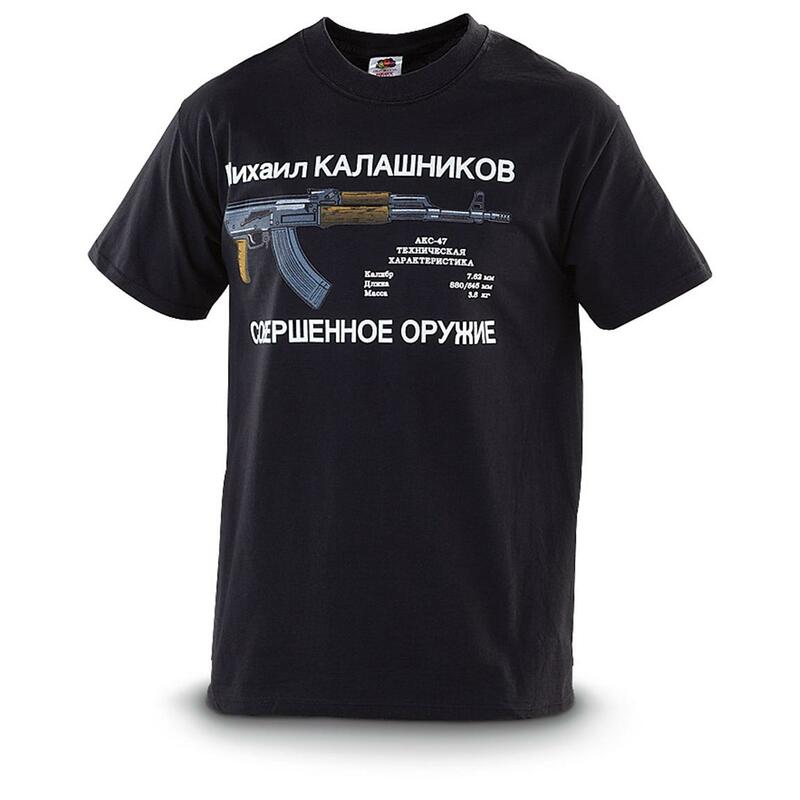 This T-Shirt presents a striking display of the prolific AK-47 in all its glory. Russian Cyrillic text in white lettering explains technical specs in stunning detail, offering authentic Cold War style seldom seen west of the Iron Curtain. Russian AK-47 T-Shirt is rated 4.7 out of 5 by 27. Rated 4 out of 5 by Scooter from Good Graphics I like my AK since it is strong & simple enough for me to maintain. Wanted a shirt to reflect that. Graphics are similar; simple & bright. It is a lightweight shirt that you can see thru even when new so perhaps best during Summer. Rated 3 out of 5 by rich from Looks Great The printing looks good. The only thing I found disappointing is that the material is unusually thin. Probably hold up gine but I expected better at that price. Just a cheapo Fruit of the Loolm with a good dye job. Rated 4 out of 5 by Opisica from Nice t-shirt Graphics are neato, quality is good, altho' it runs a little small. But I'll still wear it! Rated 5 out of 5 by rexcoastal brush beater from great conversation piece great quality and printing . wish it came with translation i can't read russian but the shirt is very cool . Rated 5 out of 5 by Beaver1983 from Very High Quality Love your T-Shirt and was plesently surprised that the T-Shirt was from a Major manufacturer. I bought three, one for me, one for my Brother and one for my Russian Wife. Rated 5 out of 5 by Joeeph from Great Quality good quality T-Shirt with a solid screen print. Very happy!